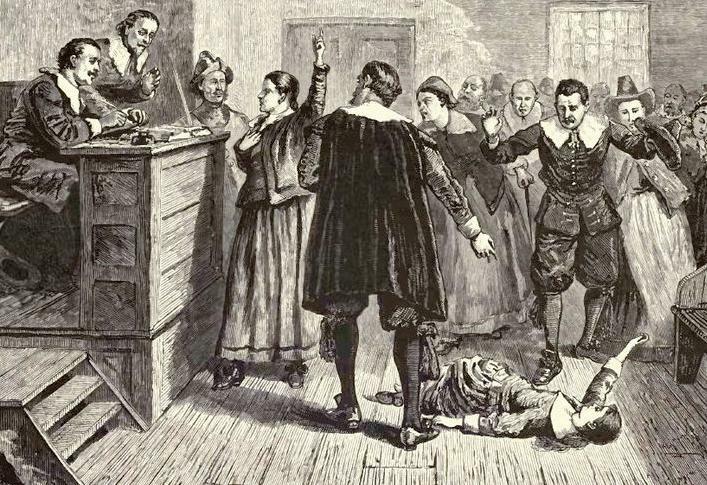 Popular culture likes to equate Salem with witches, especially this time of the year. The events behind the stories are about the lives of real people. Some of them met tragic endings. See Vol. I, No. 4 of Gardner's Beacon for one perspective on the phenomenon. 12/15/2018 -- Added image to TGSoc.org, our new site. Also, will be reorganizing the witch-related information. Today, found another 'accused witch' in Dr. Frank's tree. 10/28/2012 -- 1692, again. Errata (for Vol. I., No. 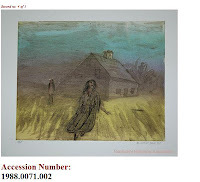 4 -- will add a method to add corrections at the Newsletter site): where it says sons of Giles, it ought to be sons-in-law (he saved his daughters' property from the State). 03/03/2012 -- Nice little school project (7M hits, not bad). 12/29/2011 -- This Beacon does not get into the subject, but here is an article that does. We'll be getting back to the history and the sociology and all of that, at some point. Much to read, first. 12/17/2011 -- Reformat right column, 2nd page, to allow missing text to be seen: Whatever turns out to be the factors, can we take comfort that the Gardners, and friends, remained sane during the period? 11/19/2011 -- Much is left to be said. 10/22/2011 -- The Beacon issue looks at a few of those who can be related closely with Thomas' kids and grand-kids. However, the whole mania would not have happened without the support of those who were in leadership roles. On the spiritual side, Cotton Mather can be shown to have meddled, such as in ensuring that Susannah Martin was hung. So, we can look at Cotton (et al) in depth. By the way, Susannah was a widow, as was Mary Parker. One motive was to strip widows of property, it seems. At least, Mary's kids were able to set some things right when they grew up. On the political side, the Crown was involved. William Stoughton, for one, tried his best to be a Cromwell, do you not think? See Frances Hill on William. In regard to whether Samuel Gardner, or John Corwin who was the brother of Jonathan, could have any moderating influence, the approval (even if implicit) of those in power would have been difficult to overcome (as we all know, if it stinks at the top, so too does it trickle down -- or, does OWS show something otherwise?). Some see it as the pond. Earlier, it required a long trek over water with a lot of unknowns. It? Yes, the big ocean over which came the great bunch of migrate'rs who became the basis for U.S. of A. Now, we are dealing, here, with genealogy. One adage is this: we handle things over here, and let those over there handle their part. That is, or as in, don't conjecture without a proper foundation upon what went on over there before the immigrant showed up here. Some families have made the link twixt here and there. Kudos to them. Many others have not. Our intent has always been to work on the bridging. How (the operative question)? Well, visits will be in order, at some point. For this post, let's start a list of resources. The 1923/24 crew (and Margaret's house) was sponsored by the Dorchester Company. Recently, I ran across this list of the funders. These were the bosses of Thomas and John and the others. So we ought to get to know them. Many, of them, turn up in various family trees, anyway, so they'll get attention. The John White page mentions his siblings. 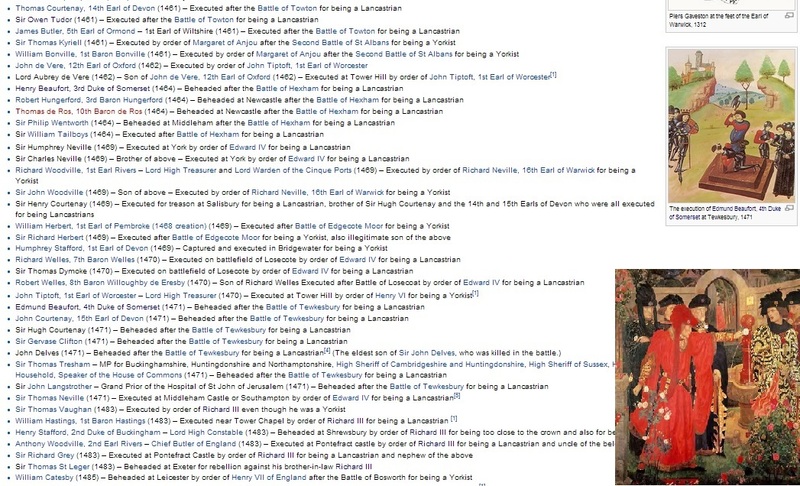 The list for Elizabeth's children does not mention Thomas. That needs to be looked at. As well, how was Thomas introduced into the Company's rolls (and roles - see the Aside)? The Dorset Parish Clerks pages provide information that comes from a lot of work by a lot of people. How many others, of this type of site, are there for us to use? 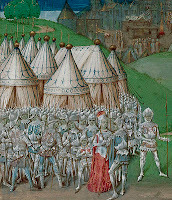 It was said that John mentioned Sherborne as a place of origin for Thomas. This site might be a place to start to look at that issue. A U.K. site relates to the work of one researcher; the organization is superb. Really like the display by counties in the New England states. Use this site a lot for reading about collateral families. 04/26/2012 -- Last month, I was reading about Alan Turing and the 100th celebration. Sherborne School was mentioned. 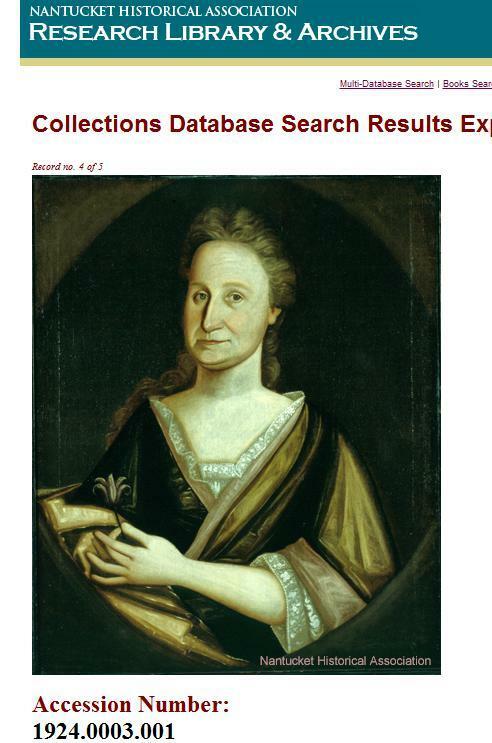 One thing to do is check whether, or not, they have records back to the early 1600s. I know that they can identify the headmaster from that period. As well, what other schools are in the area? Thomas and Margaret had three daughters. We have detailed some information on Sarah, the oldest daughter. The next two daughters were Miriam and Seeth. Miriam married, around 1657, John Hill of Salem. Whereas Miriam was born in New England, John was from Bristol, England. Miriam and John had two daughters. Miriam married William Haskell who was a descendant of Roger Haskell (Haskell Family Association). Their descendants (Haskell tree) are many. Susannah married Thomas Dow (descendants) who was the son of Henry Dow (Sanborn tree). About a hundred years ago, there was an effort to recognize a 'forgotten' man who had been overlooked since he was overshadowed by the 'gentlemen' of the times. Ah, to whom does that refer? Well, it could apply to many, as 'forgotten' is probably more apropos in the contexts being discussed here than not. Only a few rise to the level of general awareness. By doing so, are they of a better sort? Ah, philosophy coming to fore here? Now, if we limit the context to the Cape Ann venture, Dorchester Company, we could think of many. In fact, only a few of the 'old planters' have been looked at. John Tylly is still a mystery, as we see from the 'Great Migration' effort of late. The fact is that he was a 'lead' in the effort, for a year, and then cast'd aside. Getting that position has some implications that bear study; the subsequent times still need a good look or two. And, we'll be doing that. But, there was one gentleman who got recognized a hundred years ago. He has a statue in Salem, plaques in various places (like Gloucester), and the story of this ancestry filled in. There is another who is still under the radar who is the subject of this blog. Thomas. I have been pondering what would be the proper way to address what Thomas' life means. 'backbone' of the economy came to mind. 'forerunner' is another, as one hundred and fifty years after his time, we had the major shift, that was permanent, called the American Revolution. Yes, both Thomas and Margaret were ahead of their time having to bear the shackles of the theocracy so desired by some of those who flitted across the skies. But, what exactly are gentlemen? We can look at various classes of men or perhaps just realize that these pertain to role. Yet, are not effective actions within a role associated back toward the individual's characters? This is a brief introduction, as we'll go into this more. The gentleman is not by necessity aristocratic. That is mere pretension, even if it is followed by the sword. Nor, ought the property rest solely on those of the military elite. For now, there is an efficacy that comes from this; however, one has to think that somehow the masses of those who really serve (mostly of the enlisted variety) need recognition, to boot. How about adequate pay, for starter? Nor ought the property relate to the clergy. Oh no. Thankfully, we had the likes of Reverends Stephen Bachiler and John Wise countering that theocratic trend. Yes, we must not forget Anne Hutchinson and many others. Therefore, we need to, after 400 years, find some way to honor Thomas and his contributions. This blog can be considered a start. 12/02/2011 -- Start a category, Backbone, which will be used for historical comment. John deserves recognition for several reasons, not the least of which is that no account of Thomas' and Margaret's arrival and subsequent time at Cape Ann can be complete without mentioning John. We'll look at his background which seems to be as unknown as Thomas' might be. We also know that John was killed in 1636 at the time of the Pequot War. John was in charge of the fishing effort. There has been much written about Cape Ann, including White's little Plea. Some, including White, cast aspersions on those who were there. Others have offered a more reasoned view, as we see depicted in this chapter on the Fisher Plantation and this report to the US Treasury, 1853. By the way, William Hubbard (1621-1704), in his retrospective, was the first to mention John and Thomas. One can envision those in that later 17th century time asking what happened; that is, what were the real people doing during the time; that is, those who did not spawn off countless words during their time here. John and Thomas were part of the movement from Cape Ann to the Naumkeag area. Then, John seems to disappear. The Great Migration look (pg 1823) tries to make some sense. John was in the Dorchester area in the mid-1630s. He had a wife but no offspring. John was active in coastal trade, seemed to go as far as Bermuda, and was killed in Connecticut as he tried to venture, despite warnings by Lion Gardiner, up the river to Hartford. All sorts of questions remain to be answered, and old Rev White isn't here to say. How did these two men become leads in an effort that had such importance? And, then be pushed aside so easily? Ah, many, many more questions. As said before, 'speculation' requires magical gains. In less than a decade, Massachusetts was shipping tons of fish to Europe. How could this happen in a year's time? 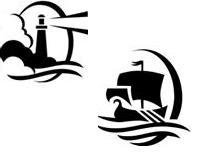 Even with the Plymouth help (as they were there in Cape Ann, to boot, hence the conflict that Conant is supposed to have avoided), how could one expect for gains to accrue so quickly? So much to deconstruct here. Thankfully, some have already started. Winthrop, and perhaps Rev White, wanted theocracy as a way of life. Though they were ahead of their time, John and Thomas were seen as 'irreligious' according to some. Actually, events 100 years in the future showed these two to be on the right path. Hopefully, time and resources will get some of these types of things better answered. 05/01/2012 -- Interest in the Old Planters is being assessed. Also, we'll do a sketch of John at this site. 10/11/2018 -- Some argument over who was first, in New Hampshire. Rev Hubbard was mentioned. As mentioned, he was the first one to mention Thomas Gardner. Too, his manuscript, though written in the 1600s, was not published until about one hundred and thirty years later. And, we almost lost it due to the mob rioting and doing damage to Hutchinson's dwelling, which, btw, was the Governor's mansion. So, the good Reverend the Rodney Dangerfield of his time? 01/07/2019 -- Add snip from Rev. 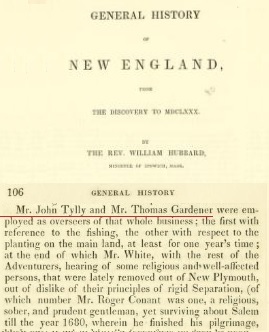 Hubbard's history that mentioned Tylly and Gardner. 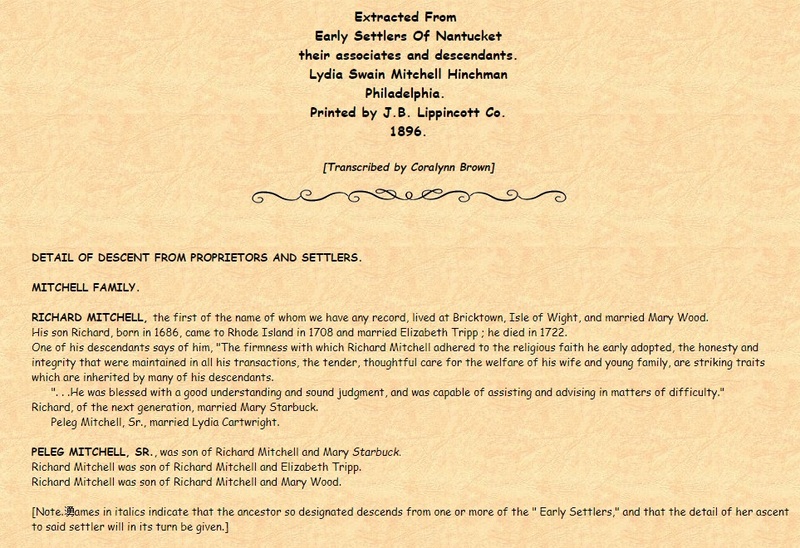 While browsing, I found a short piece that covered some of the Nantucket families. It was written by Lydia Swain Mitchell Hinchman in 1896. 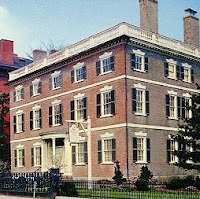 Some of the families were Mitchell, Coffin, Swain, Swift, Folger, and Stanton. Earlier, we looked at Coffin (Lucretia (Coffin) Mott) and some of the whalers. In a couple of places, we have considered that collateral families are something to look at in depth. From Lydia's list, it is easy to identify the descendants of Thomas. For instance, we can consider Edwin M. Stanton (Clemons, et al). He served, for a time, as Secretary of War under Abraham Lincoln during the Civil War. A search finds other Stantons that would be interesting to look at. A real treat, though, was a collection of Coffin stories. 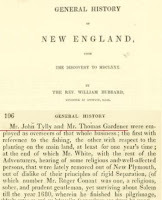 As depicted on the first page, the Gardners and the Coffins met on Nantucket; of course, early associations seemed to be iffy given the strong mindedness of the parties. However, things eventually work out as we see with all of the genealogy trees with both families on them. One thing to note is that John wanted the main town of Nantucket to be called Sherborne. We saw that, too, in the post related to the Folger writeup. Sherborne is in Dorset. John said that it was his hometown which he would have heard from his father, being too young to know when they left. If we searched, how many of these types of stories could we find? Would not they then go into an interesting account? That is, would you not want to know some quote, or such, that could be attributable to Thomas? 11/23/2016 -- Looking further into Dr. Frank's periodical, "The Massachusetts Magazine," we found R.A. Douglas-Lithgow as a contributor. He also wrote on Nantucket, and more. 04/20/2012 -- Story about John's efforts to establish peaceful relationships with the Indians. 03/28/2012 -- Mark E. Miner's site has an interesting look at the Coffin/Gardner conflict that was related to full, versus half, ownership. See post on Mary (Gardner) Coffin. There are several themes that will continue in these posts. For instance, the recent Gardner's Beacon issue briefly looked at what is behind the celebration of U.S. Independence. That conflict dragged on until almost the mid-1780s. 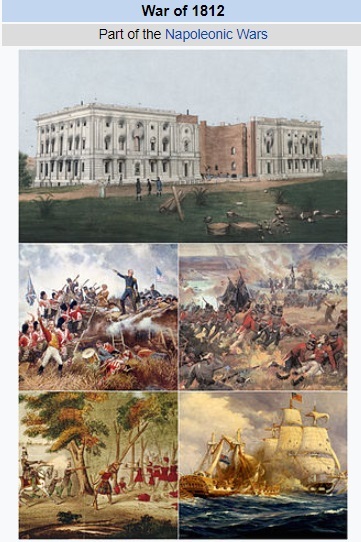 Then, it was a mere 30 years later that we had England meddling with us via the War of 1812. Another theme dealt with ancestors across the waters, such as we discussed with some of the Gardners, to wit John Lowell and Simon Stacey, including those that have royal ancestry in their tree. Samuel Knapp Gardner, a son of Simon Stacey Gardner, has several of these topics. Here is his tree (Plumer family). Samuel was a mariner and was a prisoner of war during the War of 1812. He was held in HM Prison Dartmoor. Many did not make it back from that experience. Forgetting the royals, until later, let's look at a couple of other topics. Samuel has Edward Woodman on his tree through his mother, Rebecca Knapp. Edward, as a Deputy to the General Court (see WDAHAC.org eligible ancestor list), was a member of the Ancient and Honorable Artillery Company of Massachusetts. This group was a 1638 offshoot of the Artillery Company founded in the times of Henry VIII. 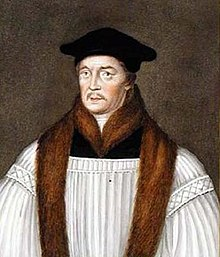 Edward Woodman is also of interest in that his great grandfather, Richard Woodman, is a noted Protestant martyr, having been burnt at the stake in 1557. Wiki has a listing of those who were victims in the events. Samuel (1781-1850) married Mary Marsh. Their children were William (-1852), Samuel (1801-1842), Mary (1803-1872), Eliza (). 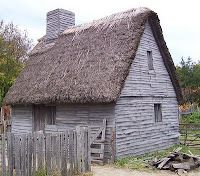 07/12/2016 -- The family lost the house due to events related to 1812's conflict.